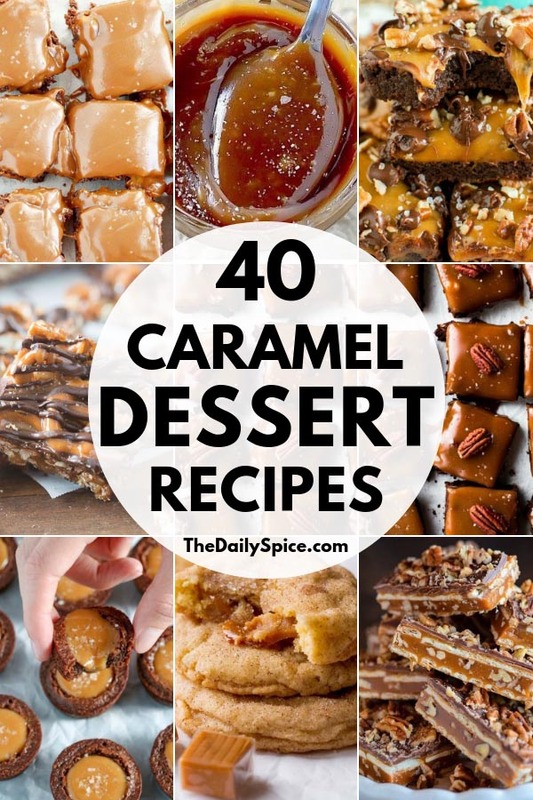 Looking for some sweet or salty caramel dessert recipes? Then we’ve got some of the best ones for you to try. 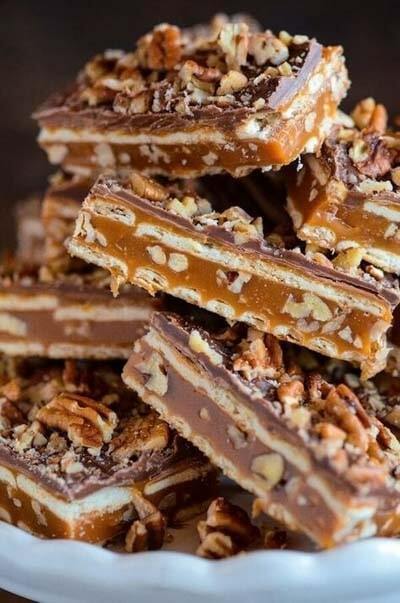 These caramel recipes are all sorts of sticky and chewy and absolutely divine! Enjoy these chewy caramel dessert recipes. As always, please follow the link below each picture to view the full recipe and instructions. Best Homemade Caramel RECIPE is perfect for making caramel apples & all your favorite fall treats & desserts. It’s incredibly easy & ready in about 30 min. It truly is THE BEST homemade caramel recipe around. And even if not, salted caramel turtle brownies will squeeze their salty, sweet, sticky, ooey, gooey, chocolate, fudgy selves onto your Christmas baking list anyway. Also, so there’s no confusion, turtles are those candy clusters with pecans, caramel, and chocolate. There are no actual animal turtles in today’s post. These Salted Caramel Brownie Bites are the perfect mini dessert! These Salted Caramel Apple Parfaits are the warm and comforting fall treat you’ve been waiting for. The parfaits are nut free, gluten free, and dairy free, and full of fall flavor. Store in a mason jar for a pre-portioned treat. The very BEST homemade fudge brownies topped with gooey caramel, sea salt, lots of chocolate chips and chopped pecans! Kick off apple season with this delicious caramel apple cake! A spice cake made with diced apples, paired with a caramel buttercream, and caramel drizzle. It’s that time of year where I want salted caramel EVERYTHING. It’s such a cozy treat! Be it drizzled over your coffee… or straight into your mouth. If you’ve been looking for an easy way to slip into the salted caramel game, this recipe is here for you. No thermometer needed, no fancy ingredients. And no hours of waiting and waiting and waiting. All you need is six minutes! Believe me, I was very skeptical about making caramels in the microwave. So skeptical that I tested this recipe for Ten Minute Microwave Caramels several times before posting it here. 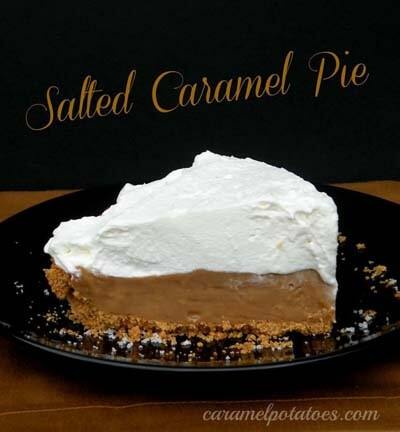 This pie is amazing and has it all- sweet, salty, rich, creamy and easy to make! What more could you want? Perfect for Thanksgiving, Christmas, and any special occasion. 5 delicious layers including graham cracker crumbs, cream cheese, butterscotch and vanilla pudding and topped with Cool Whip and caramel! The ingredients are quite standard for snickerdoodles, but it’s the ratio that makes these snickerdoodles so utterly dreamy. Lots of butter, brown sugar for a little flavor, white sugar, eggs, cinnamon, vanilla… the cookie gang’s all here. All super basic ingredients. Welcome to the ultimate step by step guide to making the best EVER Millionaire’s shortbread! A British classic, this incredibly delicious treat is seriously hard to say no to. No one really knows exactly where it originated from but I can tell you this with certainty – EVERYONE loves it! Simple and easy caramels made in the microwave with just one bowl and no candy thermometer! Sprinkle them with salt, dip or drizzle them with chocolate or wrap them in waxed paper to give as gifts! The one and only recipe you’ll ever need for Salted Caramel Frosting. This recipe is perfectly balanced, incredibly delicious and can be used for just about everything! 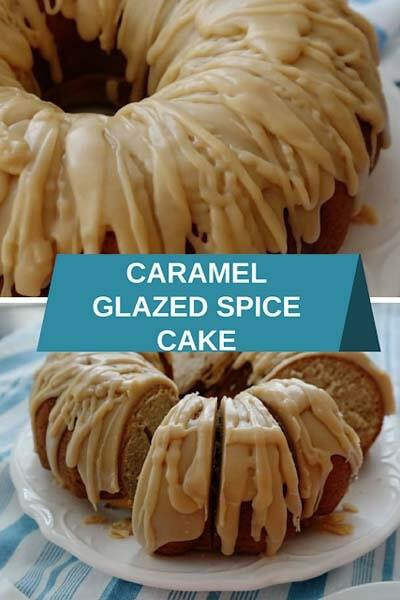 Start with a simple yellow box mix then with the addition of spices and a sweet caramel glaze you have something that will rival any cake made from scratch! These bars would be great at some kind of back to school bake sale. People will love them! Salted caramel is my favorite and this is definitely not a dessert you want to eat if you’re trying to watch your pounds. Three ingredients are all you need to quickly make smooth and creamy homemade caramel sauce. You won’t believe how easy it is to make fresh caramel at home! This will be your go-to recipe. I’m obsessed with a few flavors – chocolate, peanut butter, coconut, lemon… and of course caramel. This fall inspired Caramel Apple Bread Pudding recipe, prepared with Hawaiian rolls & caramel sauce, is easy to make and delicious for breakfast or dessert! I’m not sure where apple butter has been all my life, but I recently discovered it and wow it’s amazing. I want to put it on everything: pancakes and English muffins and toast and ice cream. And graham crackers. Don’t get me wrong, I love homemade jam, but right now it’s apple butter all the way. Caramel apple butter, to be exact. 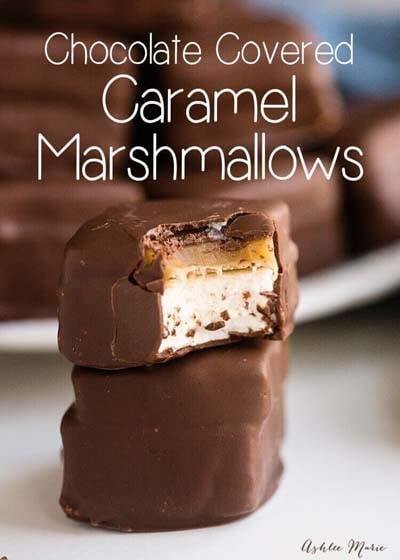 Chocolate Caramel Bars made with just 4 simple ingredients! Easy buttery crust topped with a quick caramel then swirled with melted chocolate. Triple Treat Chocolate Caramel Candy Bars are a delicious medley of chocolatey, chewy and crunchy! They’re easy to make and the ultimate sweet treat for holiday gift giving. Caramel apple muffins are bursting with warm cinnamon & sugar, chunks of apple, and caramel pieces. They bake up perfectly round like a bakery! 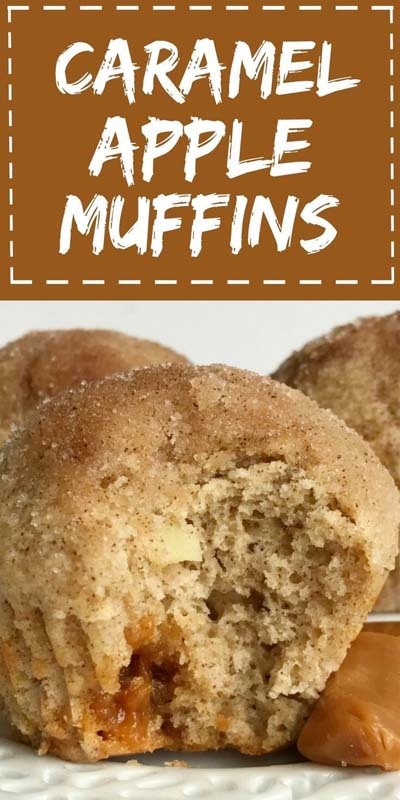 These muffins are a fun twist to the classic caramel apple. The perfect baking project for a cold & rainy Fall day. This carrot cake with caramel buttercream is the perfect dessert! This carrot cake recipe is so moist and tender. It’s made with vegetable oil instead of butter and spiced up with some cinnamon and nutmeg too. The frosting is a swiss meringue buttercream with a caramel sauce added to it. Plus, sandwiched between each cake layer is even more caramel! The soft, chewy sugar cookie is wrapped around ooey-gooey caramel that will blow your mind and bring a smile to your face. Salted Caramel Cashew Bars are a sweet and salty treat! Rich, buttery shortbread crust is topped with salted caramel & cashews for the ultimate dessert. The best cookie you will ever make. 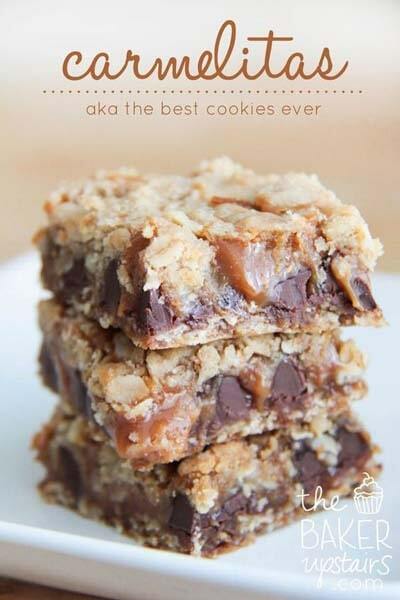 Each bite is an delicious balance of gooey caramel, chocolate chips, and crunchy and sweet cookie! Smooth salted caramel, crunchy toffee chips, and chocolate wrapped up in super easy No Bake Caramel Cookies! I can’t think of a thing not to love about these cookies! 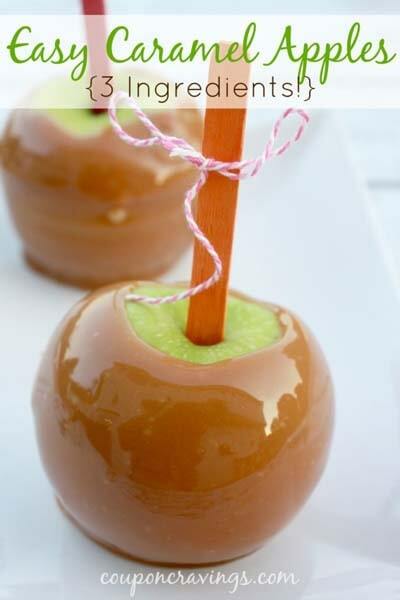 These Easy Caramel Apples call for 3 ingredients and they are so simple to make. You’ve got this one! You’ll want to make these buttery Salted Caramel Fudge Truffles again and again. Dipped in chocolate, these melt-in-your-mouth truffles are so easy to make (and eat). 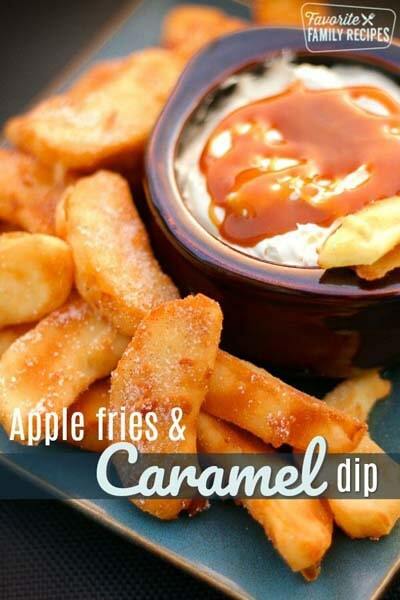 Loved these Caramel Dessert Recipes? Then pin it for later! 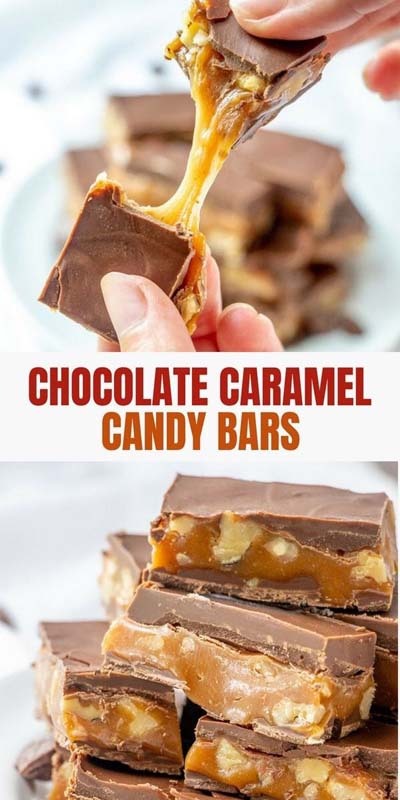 If you enjoyed these caramel dessert recipes, please take a moment of your time to share it to your desserts board on Pinterest! We would appreciate it tremendously!